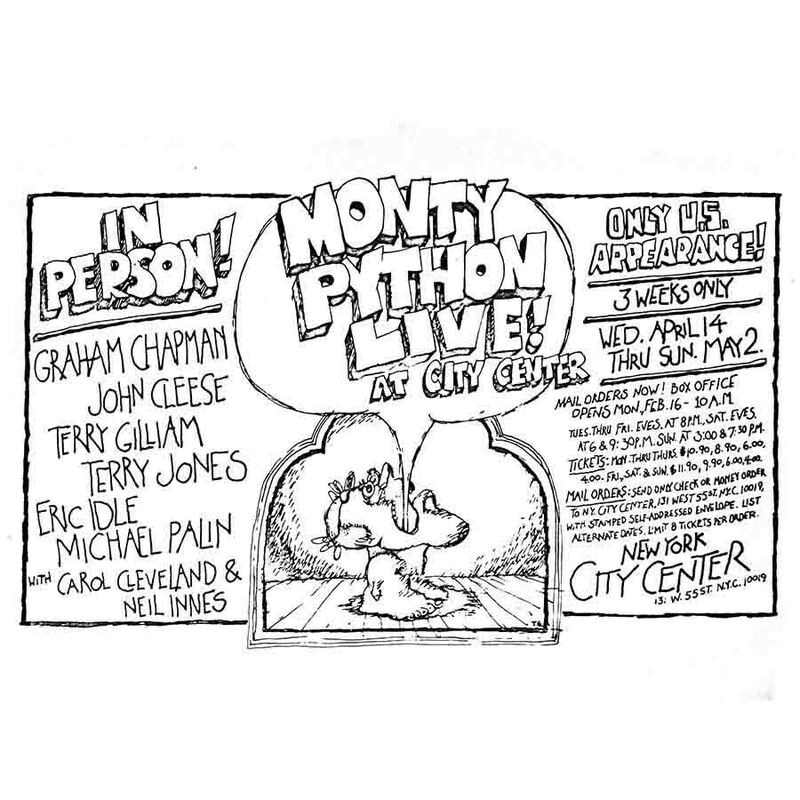 With Python's tremendous success in the United States following the release of "Holy Grail" and the broadcast on PBS of the first three series of "Flying Circus," it wasn't long before they brought their stage show to America. New York audiences, luminaries and press warmly welcomed the Pythons during their sold-out four-week engagement (as did New York thieves: John Cleese, Graham Chapman, Neil Innes, Carol Cleveland, and members of the crew were each victims of muggers, pickpockets or burglars during their stay). "We were the toast of the town in New York, we were it," Terry Gilliam said of the parties surrounding the show's opening in "Monty Python Live!" (the book about the Python’s live shows to 1980). "Andy Warhol was there. I was in a daze, all these famous people smiling at you, I don't know what to do I'm in a daze." Sketches in the New York revue included: Llamas; Gumby Flower Arranging; Solo Wrestling; World Forum; Albatross; Nudge, Nudge; Whizzo Chocolates; The Bruces' "Philosophers Song"; Travel Agent; Camp Judges; "Blackmail"; Pet Shop; Four Yorkshiremen; Argument Clinic; "Death of Mary, Queen of Scots"; Church Police (its first appearance in a stage show); "The Lumberjack Song"; and Neil Innes' "Short Blues," "Protest Song" and "How Sweet to Be an Idiot." "Cocktail Bar" was dropped, as was the "Michael Miles Game Show." "My goodness, that first night was an eye-opener," Carol Cleveland recounted in "Monty Python Live." "Here were all these people who seemed to know the sketches extremely well and they whooped and they wailed and they were dressed as Gumbys and all sorts of strange characters and we could hardly get a word out. We couldn't hear ourselves. I'd never experienced anything like that. I don't believe the guys had either and that was the first time I thought, 'Wow, yes, we made it in America.'" During the show's run, guests invaded the choir of Mounties during the "Lumberjack Song," including George Harrison and an inebriated Harry Nilsson (who wound up falling into the orchestra pit). The visit to New York also marked a Python script meeting about their next film project. "Are we or are we not going to do a life of Christ?" Palin notes in his diary entry of 28 April 1976. Cleese suggests "The Gospel According to St. Brian" as a title, and they're off and running. 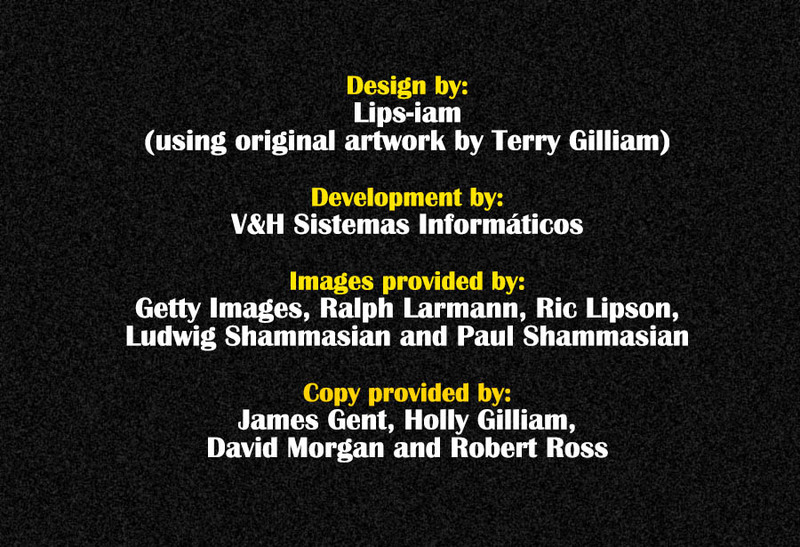 "Monty Python Live at City Center" - the album of the stage show. This was recorded and manufactured in 10 days – soon enough so that the Pythons could autograph copies at an in-store appearance in Manhattan the day after their engagement ended. An alternate recording, complete with John Cleese introducing the "glittering superstars" arriving at City Center ("I can see John Wayne, there, crouching down behind a fire hydrant – I'm sorry, it's a huge bag of pretzels"), was aired on the syndicated FM radio program, "King Biscuit Flower Hour," on 9 May, 1976.